Most of California is crisp and dry, but the middle of the state is surprisingly soggy. The Sacramento and San Joaquin rivers join with a host of smaller streams to fill up the deep indentation of San Francisco Bay. Along the way, they create the California Delta. Many people don’t even know about the Delta. 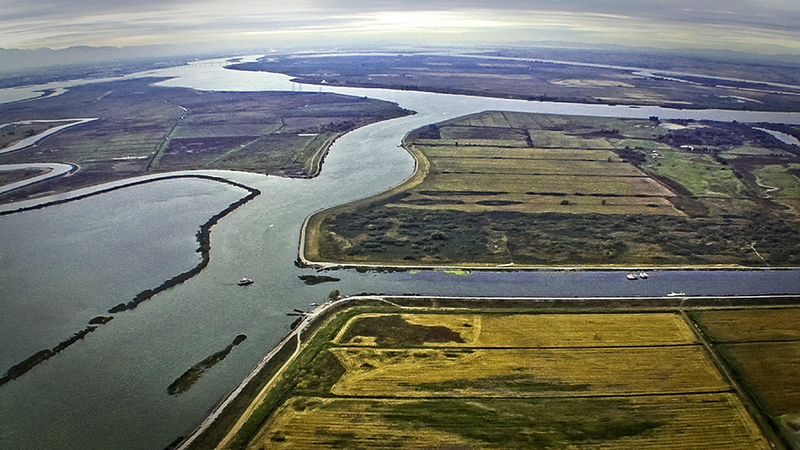 Here, at the confluence of the rivers, a huge triangular piece of geography that used to be marshland and estuary has been turned by hard labor into a quilt of “sunken islands” that run from Stockton north to Sacramento. In the 19th century, swampland was sold off at $1 an acre to anyone who would build dikes and levees and drain the formerly submerged land. And they knew just who would do the work. Thousands of Chinese immigrants who had just finished working on the transcontinental railroad were hired to dig and haul dirt and build up the levees. Windmills were constructed to pump water. And when all was done, California had acquired even more rich, fertile black dirt, spread flat as a tablecloth, in which to grow even more food. Still, the soil was a little softer than normal, so it’s only fitting that the poem Casey at the Bat, and its proverbial Mudville, should be about Stockton. In Stockton, too, came the invention of the Caterpillar tractor, needed to negotiate all that mud when ordinary tractors would bog down. 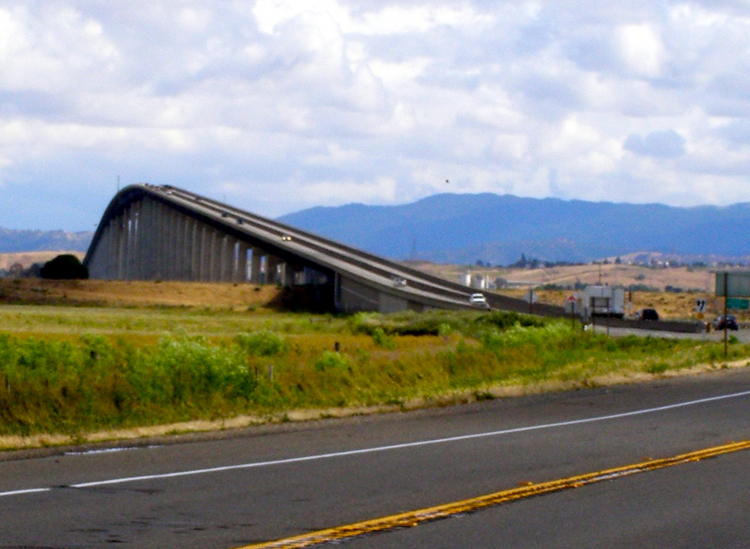 It’s quite a shock to come across the skyscraping bridge on California 160 at Antioch, over the tidal Sacramento River, and descend into land that is visibly lower than the river you just crossed. If you drive along one of the levee roads, you will look out one side of the car and see the broad waters a few feet below the levee edge, its banks congested with reeds. But look out the opposite window and you look over toward the land and see acres and acres of the tops of pollarded pear trees, with the occasional barn roof peering through. It’s disconcerting. The Delta is broken up into dozens of these large sunken islands, each ringed with a lip of levee. Farmhouses, even whole towns, are constructed in the bottomland. One of those towns is Isleton, on Andrus Island, which is separated from Brannan Island by only a ditch. It was built by and for the Chinese laborers beginning in 1874. Later, Japanese agricultural workers came, taking over the northern end of town. It burned to the ground in 1925 and, when it was rebuilt, they decided to replace the original wood with corrugated tin and stucco, the better to discourage future fires. This gives the town that scrappy tin WPA feel. In the 1930s, the town called itself the Asparagus Center of the World because it produced 90 percent of the world’s canned asparagus. 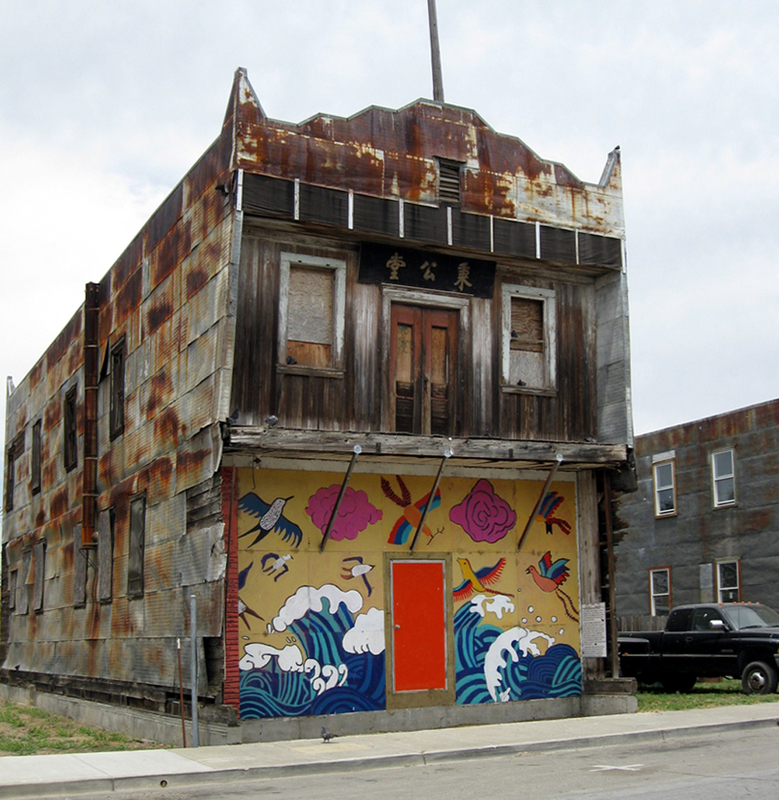 The rank of two- and three-story tin buildings lines Second Street, just under the levee. If the town is not technically a ghost town, it nevertheless looks lonesome. The Japanese population was dispersed to concentration camps during World War II and much of the Chinese population has drifted to San Francisco looking for work. There is some activity. An old bar has been turned into a bed and breakfast, although it was closed the day I came through town. A few other shops are open, but many of the buildings are boarded up or abandoned. The old Tong Society building is turned into a museum. Next door, the Quong Wo Sing Co. is a hardware store. Like most of the buildings in Isleton, its paint is peeling and its trim sags. Halfway down the block is a little antiques store. I asked its owner whether she didn’t feel a little anxious with a river flowing overhead. They were flooded once, she explained. In 1972, a farmer had taken out one of the irrigation pipes that run under the levees so they can water their crops, and he forgot to replace it. River water rushed through and weakened the earthworks, which then collapsed. But they fixed the hole and drained the land again. She has been proved right more than once. 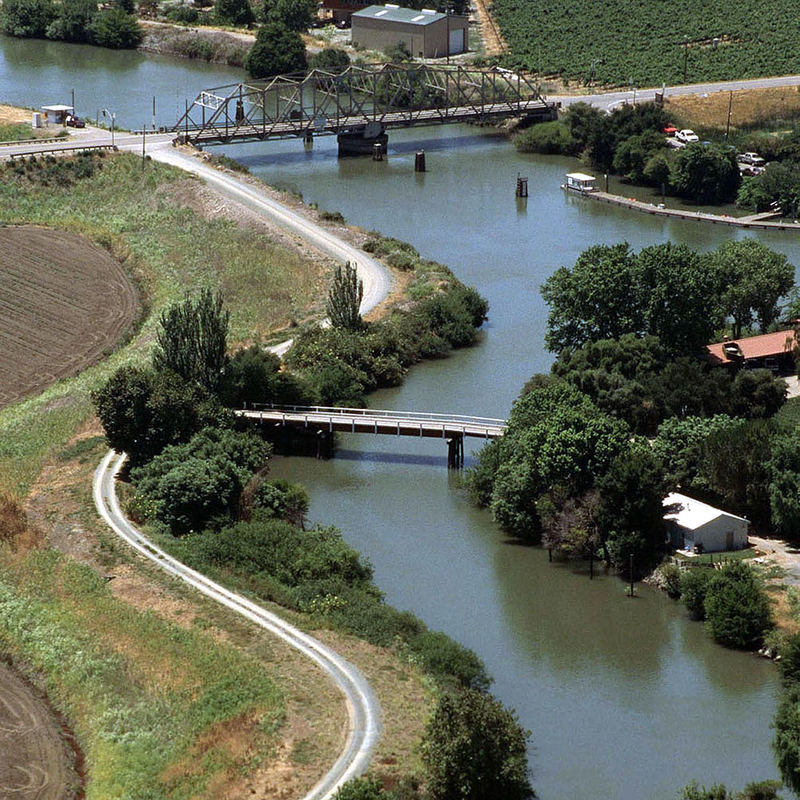 In 1998, when levees broke throughout the Delta, Isleton remained low and dry. In fact, some of the people who were evacuated from flooding elsewhere were put up at Isleton’s Hotel Del Rio for the duration. Isleton has one other claim to, if not fame, then footnote: It is the site of the annual Isleton Crawdad Festival, held each summer. The highway continues atop the levee, paralleling the Sacramento River all the way to the state capital. It crosses sides a few times over old iron truss and girder drawbridges and passes several more towns. Some, like Walnut Grove, take the precaution to build their civic buildings up at the level of the levee. The river itself isn’t exactly wild, either. It is largely channelized and makes long, straight runs between marinas. 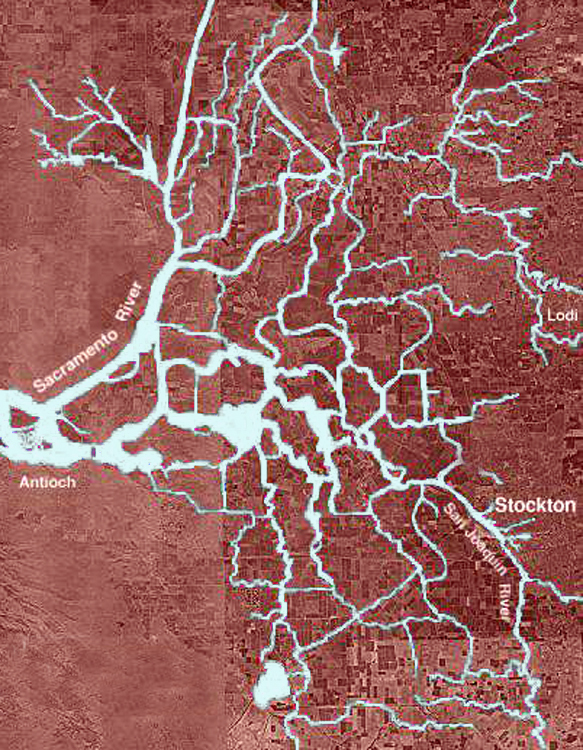 One branch of the river has been turned into the Sacramento Deep Water Ship Canal, making the inland city a seaport. And much of the water never makes it to San Francisco Bay. Instead, it is pumped south so 20 million people in Southern California can pour themselves a glass of water.